With nearly 5,000 preventable deaths occurring at work every year, there are lots of ways we could be keeping our staff safe and educated about loading dock safety. Loading dock safety equipment and proper training are one of the ways to ensure that everyone stays secure while on the job. If you haven’t properly prepared your staff, they could end up getting hurt which can cost you money and ruin your reputation. Here is your 6 point safety checklist to ensure your loading dock is safe to work on. When you’re on a loading dock, there are a number of hazards to watch out for and to take care of. If you’re watching for hazards ahead of time, you can avoid most of the accidents that occur after the fact. Look out for people slipping on oily, wet, or damaged flooring. Warn people as soon as you notice something is wrong. Put up signs or put down cones and get to work immediately. People can fall off the edges or docks or from unsecured dock plates. Be sure that everything is secure and put into place regular inspections. When a vehicle is stopped, trailer wheels should be chocked and no vehicles should be idling. This can lead to illness from carbon monoxide. Train everyone on proper lifting and carrying, letting them know when to let a forklift take care of things. Use security monitoring tools to ensure that everyone is safe at all times. If you leave clutter on your floors or don’t clean up properly, you could be putting people at risk of injury. If you have containers or packaging that hasn’t been cleaned up properly, remind those responsible to take care of it. Leaving materials in walking or driving areas can lead to injuries or damaged equipment. Trash needs to be picked up and disposed of properly, including oily rags and other combustibles. You need to have plenty of closed containers for those materials. Everyone should know what to do in the case of a spill. Adding chemical cleaners should cause a bad reaction and put people at risk. There needs to be a protocol in place for any kind of spill. OSHA has a set of standards for dealing with major spills. You should have loading dock safety data sheets on hand to relate to any chemical you have on site. Also be aware of any drips from rain or melted ice that may end up on your floor. It can slowly cause serious damage. If you don’t keep your dock plates in their proper place, you might end up leaving staff to suffer injuries. You may also end up in a situation where your equipment gets damaged from overloading your plates. Every dock plate has a load capacity written on it. Follow those rules to the letter. If you have movable dock boards, secure them. If they slip you’ll end up with injuries. IF you have to move your dock plates, don’t drop them into positions. Slide them in so that they aren’t damaged. Fall prevention training is important when working on a loading dock. Falls can be especially injurious because workers will be falling onto concrete or steel plates. This can damage and crack bones very easily. Make sure no one is running on your loading docks. If you see people fooling around and pushing one another, put an end to it. Keep everyone from dock edges and don’t allow them to jump off of them under any circumstances. Set standards for footwear and make sure that everyone is wearing sturdy shoes that can protect their feet and their toes. Steel toed boots might be the best investment you can make for your loading dock staff this year. You need to offer extensive training to new recruits when it comes to learning how to load and unload things from trucks and trailers. Whether it’s their own back or someone else’s safety they have to worry about, everyone should be able to feel secure around heavy loads. Forklifts and dollies should be used rather than lifting on their own. When things need to be lifted by hand, there should be multiple people around to help. Even small loads can damage your workers’ backs. Don’t let them lift skids or pallets on their own. When something has to be moved, the proper equipment should be employed. When things are lifted, train employees to bend their knees and keep backs straight. Their legs must do the work instead of their back, even if it feels more natural to let their back to it. Provide high-quality gloves for lifting and loading. This will ensure that no one loses their grip on anything. Everyone on your staff needs to be trained on the best practices for awareness. They should be looking around and be aware of the people working beside them. They must know when a vehicle is approaching or when hazardous materials are being handled. If you see staff playing on or riding a forklift incorrectly, put an end to it immediately. Don’t allow staff to distract operators. The horn of a forklift should be handled seriously and when it’s heard, everyone should be aware of where the nearest forklift is. If there are materials around that could fall or start tumbling from their resting place, action must be taken. One rolling piece of metal could cause a dozen other pieces to become unhinged and turn into an avalanche. Everyone should wear hard hats, hearing protection, and goggles when it’s appropriate. If you’re not focused on loading dock safety at your facility, you risk leaving your workers vulnerable. This makes work a hostile environment and the feeling that your workers don’t matter. Don’t leave them with this feeling and instead take precautions to ensure that everyone feels safe and secure at work. 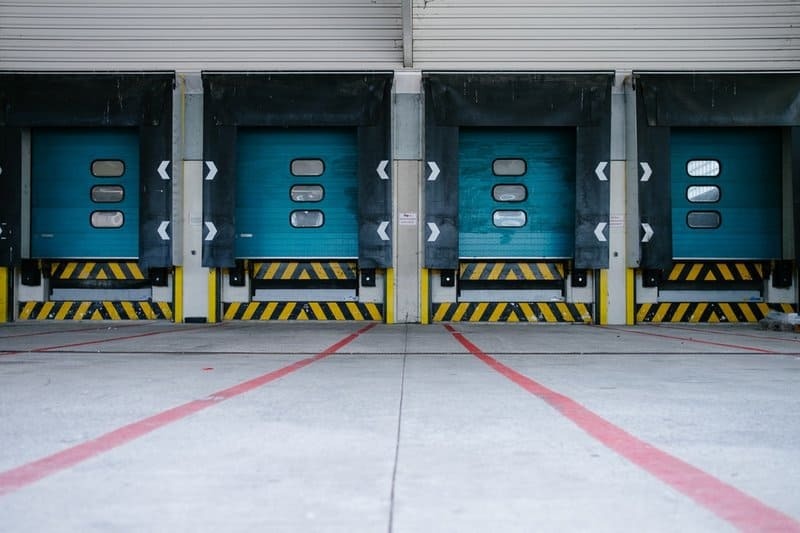 Check out our guide for more information on why safety matters at your loading dock, even for your doors.